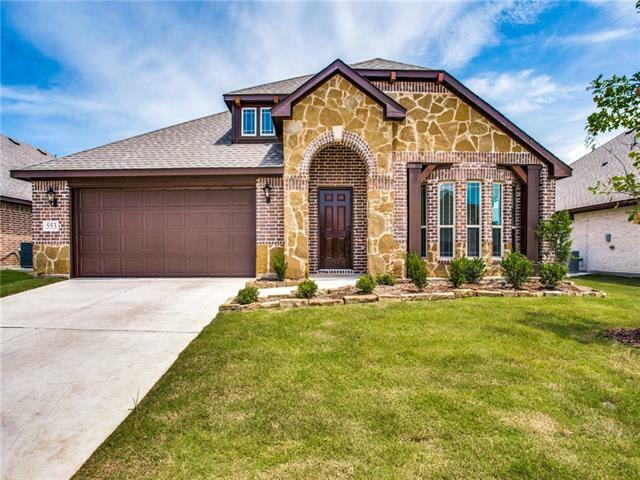 All Lavon homes currently listed for sale in Lavon as of 04/20/2019 are shown below. You can change the search criteria at any time by pressing the 'Change Search' button below. 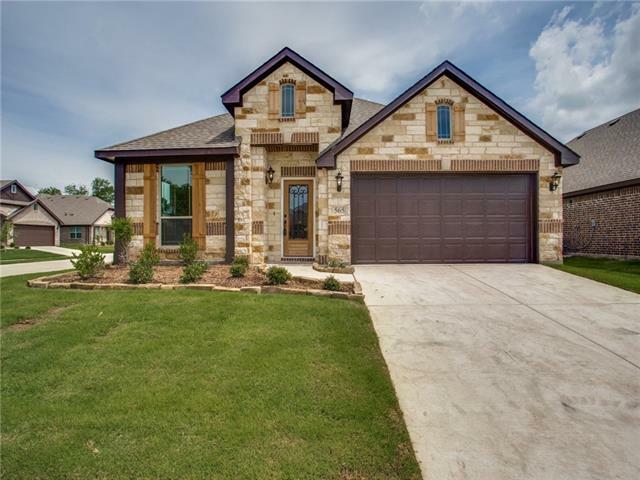 If you have any questions or you would like more information about any Lavon homes for sale or other Lavon real estate, please contact us and one of our knowledgeable Lavon REALTORS® would be pleased to assist you. 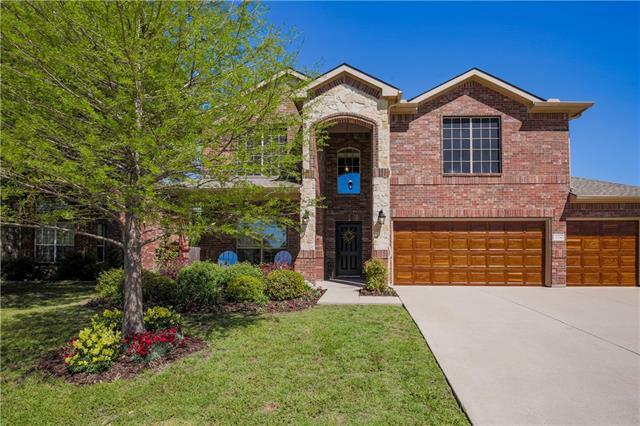 "Beautiful Lavon 4 bedroom home that feeds into sought after Wylie ISD. Home features an open concept living area to kitchen with granite counter-tops, stainless steel oven range and microwave and walk-in pantry. Master bedroom is split from other bedrooms. Master bath has dual separate vanities, garden tub and separate walk-in shower. Master also features large walk-in closet with convenient access to laundry room. Front room has beautiful french doors and could be used as bedroom or study. Bonu"
"Stop! This is it! 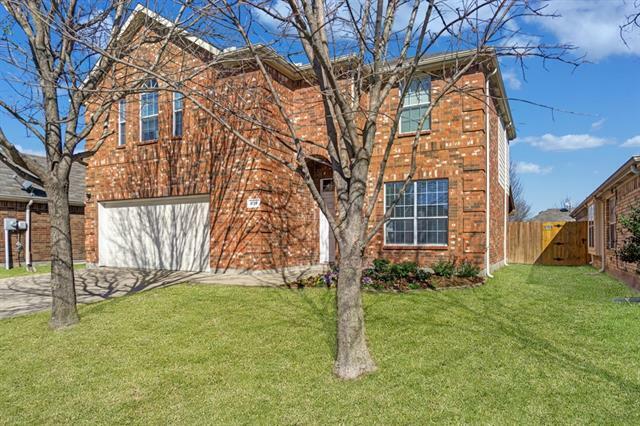 Gorgeous 2 story 4 bedroom 3 bath home that backs up to green belt. Enjoy your backyard view! Home is freshly painted and well maintained 2 bedrooms downstairs and 2 up with game room and media room. Granite countertops in kitchen that opens to dining and living space. Spacious master suite with luxury bathroom and huge walk-in closet. Nice driveway leading up to 3 car garage. All that is missing is you! Clubhouse, community pool and playground included in HOA." "FORMER MODEL HOME READY FOR MOVE IN! 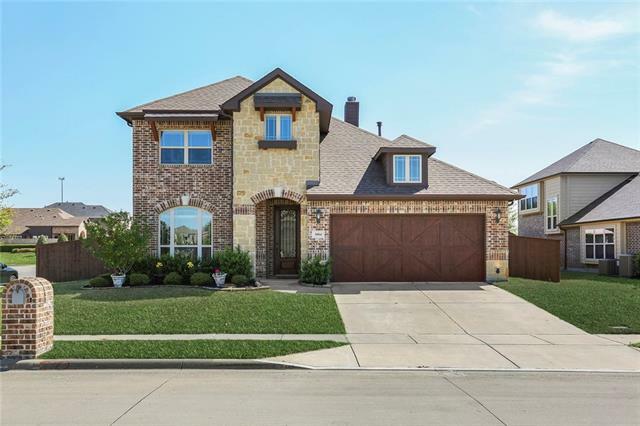 This 4 bed, 3 bath home features an open floor plan and tons of upgrades including wood-look tile flooring throughout the home- all the beauty of wood without the maintenance! 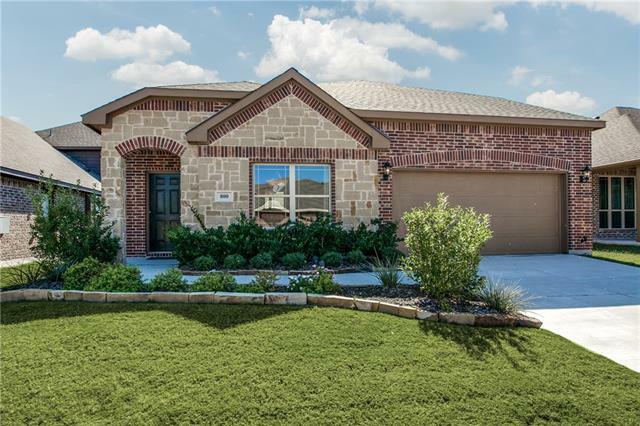 Gourmet Kitchen with ss appliances, custom painted cabinets, granite counters and island; Study with lockable glass door; Master Suite with walk-in closet, his and hers sinks, garden tub and separate shower with tile accent strip; Covered front and rear porch; FULLY LANDSCAPED. Call tod"
"This beautiful 4 bed, 2.5 bath home on large corner lot has great curb appeal with a large front and side yard with landscaping. Inside you will find lots of windows for natural light, wide-open living and dining spaces with beautiful views of large private fenced backyard and 1st floor Master ensuite. Kitchen features lots of counter and storage space, a large island with breakfast bar. Upstairs you will find 3 spacious bedrooms and game room. Incredible backyard living and dining areas with pl"
"NEW Bloomfield Home on Corner Homesite! 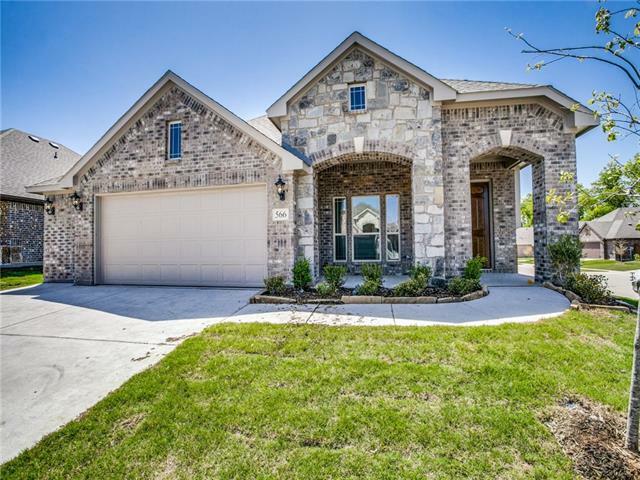 This beautiful four bedroom, two bath open floor plan features a stunning stone exterior; Wood look tile throughout open areas - all the beauty of wood without the maintenance! Gourmet Kitchen with SS appliances, GRANITE counters, CUSTOM cabinets, and upgraded stone tile backsplash; Master Bedroom with large walk-in closet, garden tub and separate shower with upgraded tile; Study with glass French Doors; Fully landscaped with a covered patio, perfect for o"
"Spacious, Energy Efficient 5 bed-2.5 bath home on beautiful over .50 acre lot. Plenty of room to spread out here. Master bedroom is down stairs. Covered porch on front to enjoy your morning coffee or sit on the back covered patio for an evening out with friends and family. Your family will not out grow this home. RV-Boat parking on side of home. No HOAs." "NEW Bloomfield Home ready Spring 2019! This beautiful open floor plan home features a stone exterior with bay windows; 4 beds and 2 bath; Gourmet Kitchen with SS appliances, custom cabinets, GRANITE counters, and custom subway tile backsplash; Master Bedroom with luxurious walk-in closet, garden tub, separate shower with tile accents, and dual sinks; Study with glass French doors; Standing shower in second bath; Wood look tile flooring throughout the home for all the beauty of wood without the m"
"BRAND NEW Bloomfield Home on Corner Home Site! 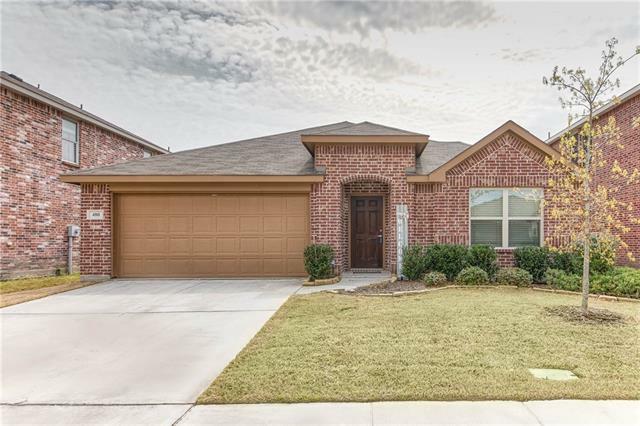 This 3 bed, 2 bath home features an open floor plan and a variety of upgrades including wood-look tile flooring throughout the home- all the beauty of wood without the maintenance! Gourmet Kitchen with ss appliances, custom painted cabinets, subway tile backsplash, granite counters and island; Study; Master Suite with walk-in closet, his and hers sinks, garden tub and separate shower with 12x24 master shower tiles; Large front and rear porch; 2.5 ga"
"FORMER MODEL HOME READY FOR MOVE IN! 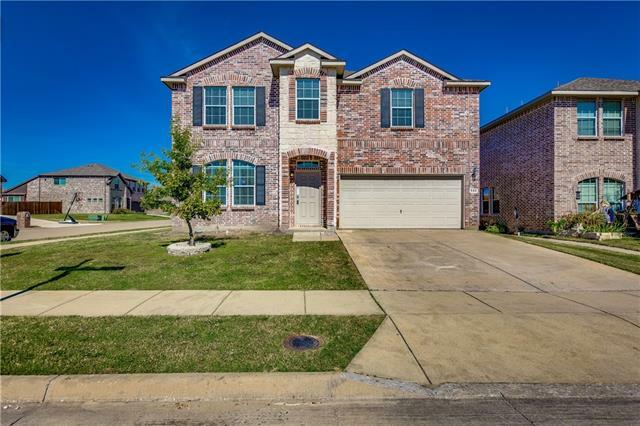 This 4 bed, 3 bath home features an open floor plan and tons of upgrades including oversized tile flooring throughout the home! 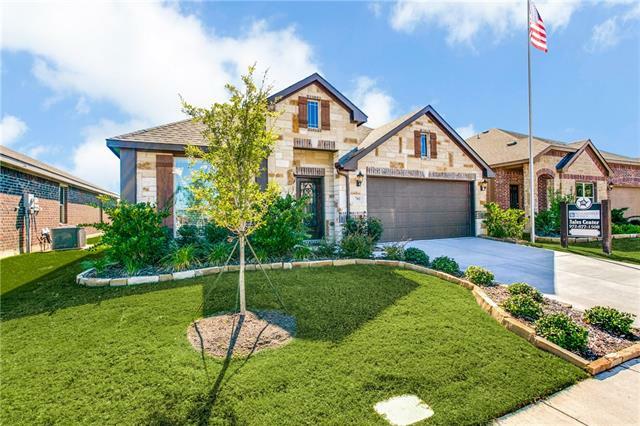 Gourmet Kitchen with ss appliances, custom painted cabinets, granite counters and island; Master Suite with walk-in closet, garden tub and separate shower with tile accent strip; Covered front and rear porch; FULLY LANDSCAPED. Call today!" "New Bloomfield Home READY SPRING 2019! LOCATED ON MASSIVE CORNER HOME SITE! This 3 bed, 2 bath home features wood look tile throughout the open areas - all of the beauty of wood without the maintenance! Gourmet Kitchen with ss appliances, custom cabinets, subway tile backsplash, granite counters and island; Master Suite with walk-in closet, dual sinks, garden tub, and separate shower with accent tile; Study with glass French doors; Covered front and rear porch; Fully landscaped. 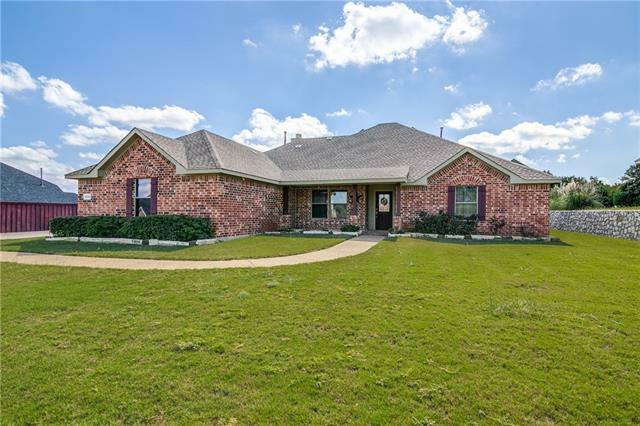 This home is on "
"Totally charming 3-2 in Lavon! 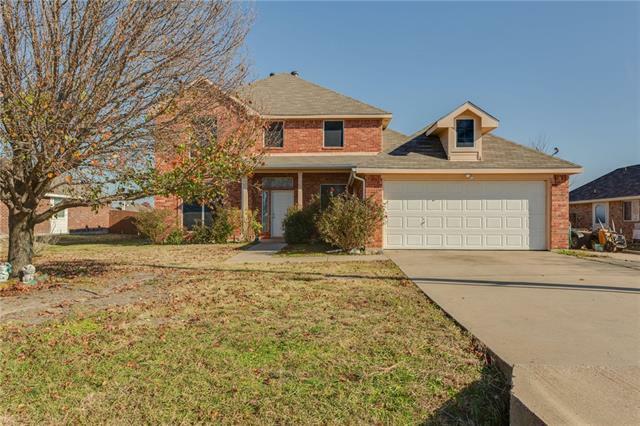 Just minutes to Lavon Lake & numerous outdoor activities. Bright & light floor plan with a spacious living area and separate office or flex room. Hardwoods throughout living area with fresh paint! Large dining area is perfect for entertaining or holiday parties. Over-sized kitchen boasts ample counter space and tons of cabinet storage with a new sink. Beautiful master suite with lots of natural light, raised ceilings & peaceful views over the backyard. The lovely m"
"UPGRADES such as NEW $6,000 HVAC summer 2017. Stainless appliances, laminate wood, granite in 2015. Roof, water heater and garage door in 2016. Eat in kitchen with granite, breakfast bar, large pantry. WINDOWS! Downstairs and upstairs living. Formal dining could also be living. Spacious bedrooms with walk-in closets. Fabulous backyard with oversized covered patio! A must see. Home is close to activity center, pool and playground. Grand Heritage is an enjoy more at home lifestyle. Impressive "
"This beautiful one story home features 4 spacious split bedrooms on an interior landscaped lot. This home looks like a new home inside and out. It is an open concept, bright entry, ample storage and huge master suite! The master bedroom could double as a bedroom and sitting area or office. The gourmet kitchen features stainless steel appliances, island and contemporary cabinetry. The pantry is huge too! The home features 15 seer heat pump, solar screens and energy efficient light bu"
"Built in 2007, this Lavon two-story corner home offers granite kitchen countertops and a fireplace. Upgraded features include fresh interior paint and new carpeting in select rooms. The community pool is a part of the HOA. Home comes with a 30-day buyback guarantee. Terms and conditions apply."